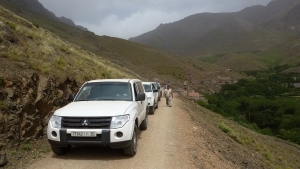 Kasbah Angour offers an exhilarating discovery of some of the finest scenery in the Atlas Mountains in a day’s excursion by 4×4 vehicle. We follow in part a narrow, windy track normally only used by local villagers as an access into/out of a glorious river valley with dramatic mountain walls. 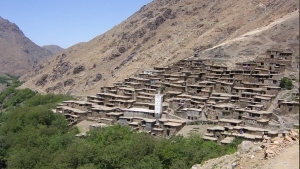 The highest village in the valley sits at 2400m with commanding views northwards towards our finish point. We suggest that only those with a head for heights take part. 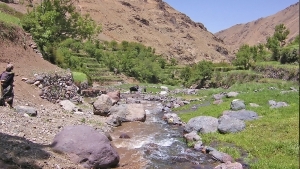 Our route allows you to take in many scenes typical of our region, set against the backdrop of the imposing mountain ridges, which, for much of the year, are covered in snow – pretty Berber villages constructed from pise mud which cling precipitously to the steep-sided valleys; orchards of fruit and nut trees (walnut, cherry, apple, almond); hillsides and valley floors covered in a patchwork of agricultural terraces; and shepherds tending their goat & sheep flock. 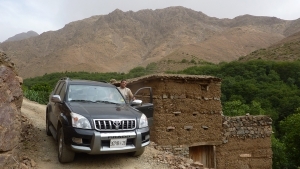 There is plenty of time for a picnic lunch at a beautiful vantage point. 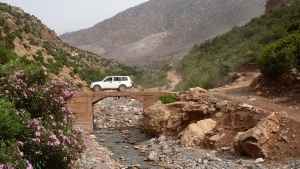 Kasbah Angour offers an exhilarating discovery of some of the finest scenery in the Atlas Mountains in a day’s excursion by 4×4 vehicle. We follow in part a narrow, windy track normally only used by local villagers as an access into/out of a glorious river valley with dramatic mountain walls. 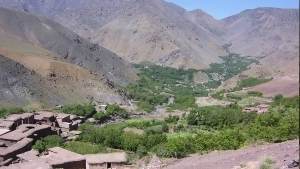 The highest village in the valley sits at 2400 m with commanding views northwards towards our finish point. We suggest that only those with a head for heights take part. 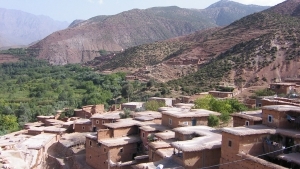 Our route allows you to take in many scenes typical of our region, set against the backdrop of the imposing mountain ridges, which, for much of the year, are covered in snow – pretty Berber villages constructed from pise mud which cling precipitously to the steep-sided valleys; orchards of fruit and nut trees (walnut, cherry, apple, almond); hillsides and valley floors covered in a patchwork of agricultural terraces; and shepherds tending their goat and sheep flock. 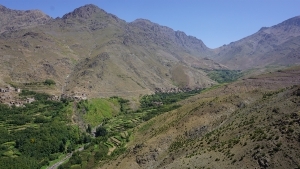 There is plenty of time for a picnic lunch at a beautiful vantage point once we gain height.